or email lists. You may however forward to your individual friends, and invite guests, without restriction. The Chilluminati invite you, our friends and supporters, to a private party. An evening of freeform psychedelic chillout. The Milwaukee-based Paka Paka Lightshow consists of the father & son team Jerry and Reuben Fortier and long time collaborator Dale Kaminski. In 1968, Fortier founded the Eyes of Khamphalous Lightshow in Madison, WI. As the visuals behind the Broadway production of “Warp” and the resident lightshow for the Melkweg and Paradiso clubs in Amsterdam from 1969 to 1972, the Khamphalous Lightshow created a unique psychedlic visual experience. 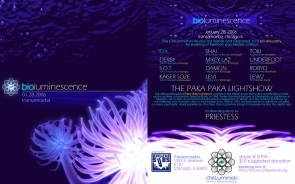 The Paka Paka Lightshow brings this experience into the digital age. When: Door opens at 8PM. There should be ample street parking on Wabash. SUGGESTED $10 DONATION to cover cost of venue and help defray artists’ travel costs.